While intelligence agencies across the globe are busy boosting their communication interception capabilities, Indian authorities have not forgotten the centuries-old methods adversaries might use, literally intercepting a spy pigeon from Pakistan. Hard to believe but true. It is one of the few occasions recently that a bird has been deemed a “spy” and arrested by authorities after the discovery of a secret message or a wire-like objects on their bodies. The white pigeon is believed to have crossed from Pakistan earlier this week, before a 14-year-old boy in the Indian village of Pathankot, Punjab state, captured it some 4km from the border. The boy rushed to hand the “spy” over to police, who discovered a message in the Urdu language and numbers that authorities believe were part of a landline telephone number in Pakistan’s Narowal district. Puzzled by the discovery, police sent the bird to get x-rayed for more possible clues. “Nothing adverse has been found, but we have kept the bird in our custody,” Pathankot senior superintendent of police (SSP) Rakesh Kaushal told the Times of India. “This is a rare instance of a bird from Pakistan being spotted here. We have caught a few spies here. The area is sensitive, given its proximity to Jammu, where infiltration is quite common,” said Kaushal. Because the messenger was seized as an inter-state security conference was taking place among Punjab police, authorities decided to make a diary entry classifying the bird as a “suspected spy”, and notifying intelligence agencies. The pigeon discovery also comes two days after the country’s Intelligence Bureau (IB) issued an alert warning of Indian Mujahideen being active in Jammu and Pathankot regions. This is not the first time birds have been arrested for spying. 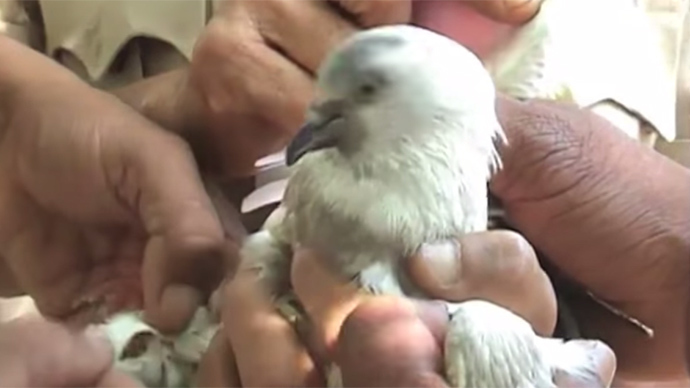 In 2008, Iranian authorities arrested two pigeons allegedly spying on a nuclear facility. In 2013, a stork was detained in Egypt also on espionage charges.